On September 18th, Universal Music/EMI Japan reissued over 100 soundtrack CDs as limited-editions, and at spectacular budget prices of only $9.99 each ($14.99 for double CDs). One of these was for Toho's 1984 sci-fi film BYE-BYE JUPITER! 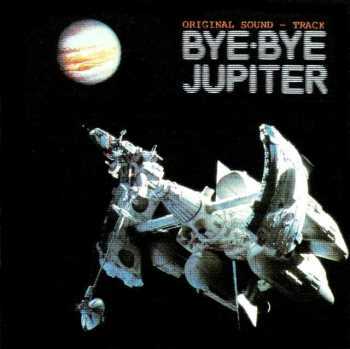 Generally regarded as the very first Toho sci-fi soundtrack to appear on compact disc, BYE-BYE JUPITER was originally released by Toshiba-EMI in 1984 on LP, cassette and CD. For reasons unknown, it has remained out of print ever since, making it extremely difficult to find, with the original CD usually selling for very high prices when it showed up for sale. Now, nearly 30 years later, BYE-BYE JUPITER has finally been re-released on CD, as a straight reissue. Featuring a score by Kentaro Haneda and four very hard-to-find on CD stereo vocal songs (2 by Yumi Matsutoya, 2 by Jiro Sugita), this soundtrack is sure to please fans of the movie. The movie itself was very unusual for being kind of a cross between a sci-fi film and a musical - think 2010 mixed in with some XANADU! The score itself is still a good one from Haneda and should be instantly recognizable to everyone who has seen the film. All four songs (which are the stereo record versions), especially the self titled Bye-Bye Jupiter by Jiro Sugita and Voyager by Yumi Matsutoya (aka Yuming), are excellent, extremely catchy examples of Japanese 80s pop. Since this soundtrack is a straight reissue of the original 1984 CD, it has not been expanded with extra music, as some of the score still remains unreleased to this day. It features the same 18 tracks, a copy of the original booklet, the original back insert artwork and even the printing on top of the CD resembles the original disc. However, this new re-release differs from the original CD in one very nice to see aspect - it has been remastered! The original '84 CD featured very early, mid-80s mastering which sounds a little primitive by today's standards, but luckily, Universal has decided to update the sound quality for this soundtrack and it's a noticeable change - it is a bit warmer, sounds a little louder and more upfront in the speakers and has nice levels of bass compared with the original CD. One can only speculate why Toho Music did not re-release this soundtrack themselves (perhaps it is a licensing issue or some other reason), but Universal/EMI has done a wonderful job reissuing the original '84 CD and the price is certainly very reasonable. It is not known exactly just how limited this soundtrack is (and the other reissues), but if anyone has an interest in picking up this BYE-BYE JUPITER soundtrack CD, it would be advisable to order it sooner than later. As of this writing, this CD can be bought online at places such as Arksquare and CD Japan.